Would you like to create a stunning coming page for your WordPress website? Every website should make a pre-launch coming soon page before actually making your site live. This allows you to build an audience, email list, and get people excited about your new website before the actual launch of your website. 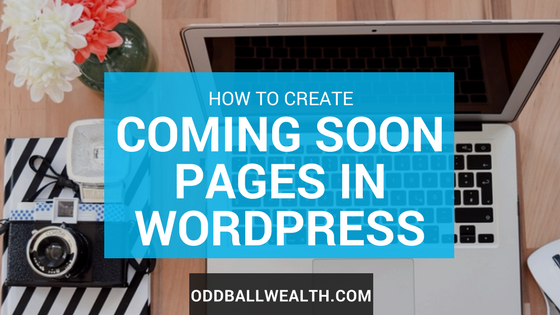 In this post, you’ll quickly learn exactly how to create a beautiful coming soon page in WordPress. Coming soon pages are much more than just a static webpage that lets people know when your site will go live. They’re an amazing and strategic tool that can make your website extremely successful before it even goes live! Coming soon pages can be used as a lead generation tool to capture email addresses and build a valuable email list. They’re also great for getting people excited about your website, building awareness, and so much more. Measuring Interest – Coming soon pages are a great way to find out if the idea for your website will be successful. You’ll be able to see whether or not people are interested in an idea before investing a bunch of time and money on it. Building Awareness – Coming soon pages are an essential tool for spreading the word about your website before it’s actually built and live. You’ll be able to let people know what your site will be about, the type of content it’s going to have, and when the site will be live to the world. Build Anticipation and Excitement – Use your coming soon page to get people excited and talking about your website. Use it to give visitors a reason to share and spread the news about your new site! Lead Generation – This is by far one of the most valuable reasons to make a coming soon page. You’ve probably heard the old phrase “the money is in the list” and it’s true! Use your coming soon page as a lead generation tool for capturing email addresses and getting people to your social media profiles. This way you’ll have built up an email list and followers on social media before your actual website launch! In order for you to create a coming soon page in WordPress, you’ll need to get WordPress web hosting and install WordPress. For more details and instructions, use one of these step-by-step guides on how to start a WordPress website or blog, and a guide on how to start a website in your underwear. The first thing you need to do to create a coming soon page is install and activate the SeedProd plugin. SeedProd is a premium plugin for WordPress. It only costs $29 for a single website license, which includes support, updates, access to all themes, and more than 5,000 stock images. Once the plugin is activated, to set up your coming soon page, go to ‘settings’ and then click ‘Coming Soon Pro’. Next, click the ‘Enable Coming Soon Mode’, and then click ‘Save all changes’. Now, search engines and anyone who visits your website will automatically be redirected to your coming soon page. However, when you’re logged in, you’ll be able to view your entire site and all its contents. Now, you’ll want to the SeedProd theme customizer by clicking on the ‘Edit Coming Soon / Maintenance Page’ button. From here you’ll have a nice list of awesome coming soon page themes and templates to pick from. All the themes and templates can be easily customized in any way you’d like. Look through all the different themes and pick the one you like most. Once you pick a them, it’ll open a live preview and allow you to make any changes or customization’s. If you look on the left menu, you’ll be able to view a list of different options. To change the settings of an option, click on the option to view its settings and make any changes. You’ll be able to view any changes instantly in the live preview. You can see what your coming soon page will look like on different devices in the live preview by clicking on ‘desktop’ or ‘mobile’ view. Click on the ‘save’ button once you’ve finished and are satisfied with any changes or customizations made. Remember, you can also change or add content, a different background, add your own logo, social media sharing buttons, an email signup form, website progress bar, countdown timer, and many other things at any time. Every option is very simple and quick to customize and setup. Now, you’ll learn how to add and setup an email signup form to your coming soon page, and sync it with your email marketing service provider, so you can begin getting subscribers and start building a list of email addresses. To do this, using the menu on the left side of your screen, simply click ’email form settings’ and that menu option will expand with a list of option settings. Next, under the ‘Save Subscribers To’ option, choose the email marketing service provider that you use. To continue and go to the settings page for your email marketing service provider, click the ‘Configure’ button. On this screen, SeedProd will ask you to enter in your API key, which you can find by going to your email marketing service provider’s website and logging into your account. Then, review any additional settings and choose which email list you want to use, or create a new one. Once you’re finished, remember to click the ‘Save and continue editing’ button and you’ll be brought back to the theme customizer section. Your coming soon page is now all setup and can now collect email address. Any visitor who subscribers and enters in their email address will automatically be added to your email list.